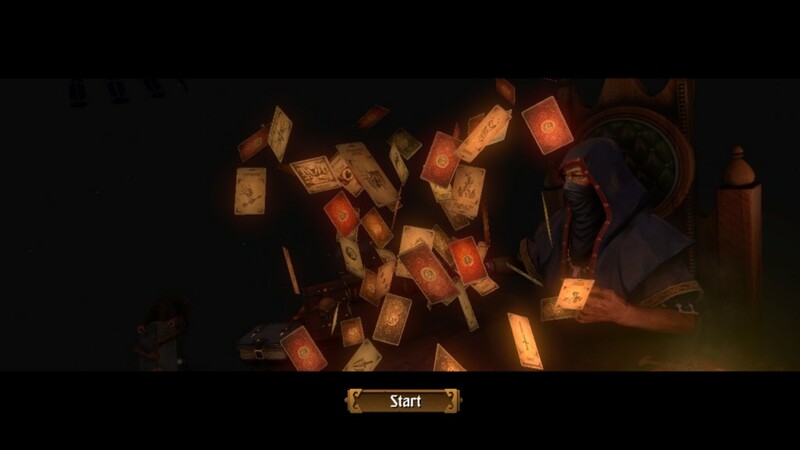 Hand of Fate is a bat­tle of skill, luck, and wits against the Card Dealer. You go through a ran­dom­ized dun­geon craft­ed out of cards (lit­er­al­ly) that the play­er un­locks and bat­tle the var­i­ous denizens hid­ing with­in for the sake of more cards, gold, food and equip­ment. The cards are based upon mem­o­ries from the play­er char­ac­ter, who is un­named with­in the game and is silent. The same can­not be said for the deal­er, though, who is a per­cep­tive and re­ac­tive gen­tle­man. Constantly quip­ping, his voice be­comes your only com­pan­ion as you play the card game with­in, fac­ing the dan­gers of your character’s mem­o­ries. I can do this, I just don’t want to. As the play­er in Hand of Fate, your his­to­ry is un­known. You are left to gath­er clues of his life via mem­o­ries, rep­re­sent­ed by cards in the game. These cards present a num­ber of choic­es and cre­ate some­thing of a Choose your Own Adventure style of game­play. There are sev­er­al decks avail­able, both to you and the deal­er them­selves, with the deal­er be­ing giv­en a deck full of en­e­my cards. The en­e­mies you face in your long life of ad­ven­ture fall un­der one of four suits: Dust, Scales, Skull, and Plague. Each rep­re­sent a spe­cif­ic en­e­my type and as the player’s vic­to­ries pile on, ad­ver­saries you face be­come more dif­fi­cult. New abil­i­ties and new power‐ups for the play­er char­ac­ter are earned through de­feat­ing the Face cards of each suit and are some­what coun­tered by the min­ions of each suit gain­ing new pow­ers them­selves over time. The suit of Dust rep­re­sents all the ban­dits the main char­ac­ter has ever faced, and are nu­mer­ous. They tend to come af­ter you one or two at a time. Once you reach the next tier of the card case, they gain the abil­i­ty to throw knives — usu­al­ly at the worst pos­si­ble time. The suit of Scales rep­re­sents vi­cious sword and shield bear­ing lizards; bipedal crea­tures that of­fer the tough­est fights. They are slow mov­ing, hard hit­ting, and de­flect reg­u­lar weapon strikes off their shields with ease. The ranged lizard units spew fire­balls — Which can hurt but are able to be re­pelled like reg­u­lar pro­jec­tiles — who gain the abil­i­ty to coat them­selves in fire. The suit of Skull rep­re­sents the end­less un­dead. While they are frag­ile, they are quick to re­turn from the dead and can present a chal­lenge to the un­wary. They are quick to move and at­tack, some­times com­ing in armed with mus­kets. Once the third tier of the card case is reached, they gain the abil­i­ty to come back from the re­cent­ly dead. The suit of Plague rep­re­sents a se­ries of gi­ant bipedal rats that are bas­tard­ly lit­tle things. Often they will gang up quite fierce­ly and are the first min­ion units to have un­block­able at­tacks. They are backed up by units that re­peat­ed­ly throw knives one af­ter the oth­er, mak­ing them tricky to deal with. Once they are pow­ered up, the melee rats gain the abil­i­ty to leap. Leading each of these suits are the Face cards: Jacks, Queens, and Kings. Each of these cards are boss cards, which upon de­feat­ing them, will be added to fu­ture ran­dom­ly cre­at­ed dun­geons as mini‐boss fights, as their cards are added to the Dealer’s deck. 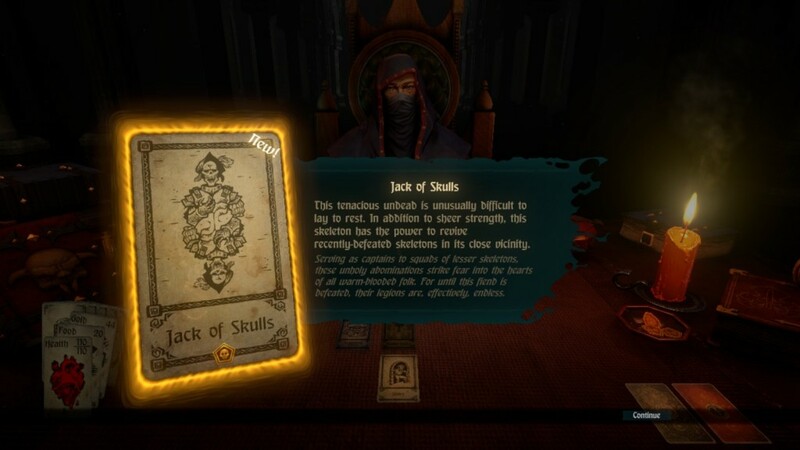 The Jacks are of­ten the first en­e­mies one will face af­ter procur­ing a card ar­ti­fact. 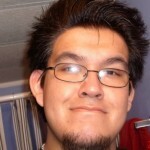 They are also the most like­ly to be matched up against in sub­se­quent playthroughs in the dun­geon. Queens come in sec­ond most of­ten and are vi­cious, tend­ing to drop in with a tow­er that pro­vides ranged and oth­er means of sup­port. And fi­nal­ly the Kings. While not al­ways the tough­est or last you will fight to gain an ar­ti­fact card, they do come in with a small army of min­ions and he will of­ten em­pow­er them in some man­ner. 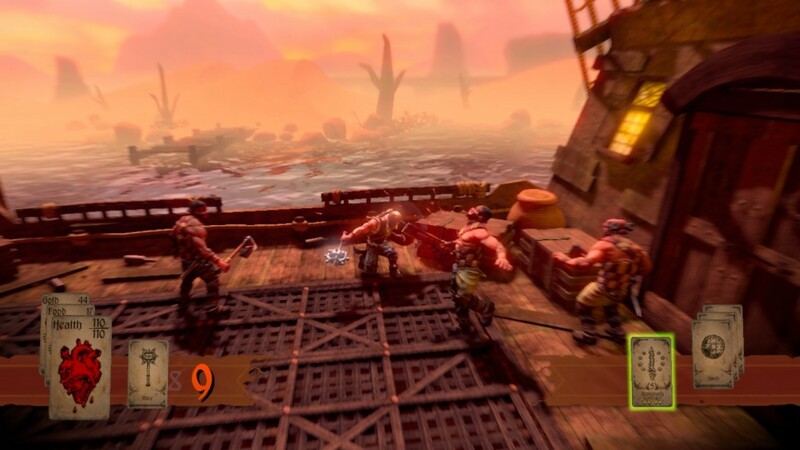 Hand of Fate’s com­bat will be fa­mil­iar to ac­tion ad­ven­ture vet­er­ans whom have en­joyed games like Batman: Arkham Asylum, though, it’s not near­ly as grim and dark as the epony­mous Dark Knight. As for whether it is best with a game‐pad or key­board, this re­view­er chose to use a game‐pad. For those un­fa­mil­iar with Batman: Arkham Asylum, the com­bat re­lies on six but­tons: dodge, block, bash, & at­tack, with the bumper and shoul­der but­tons re­served for mag­ic cards and item abil­i­ties. 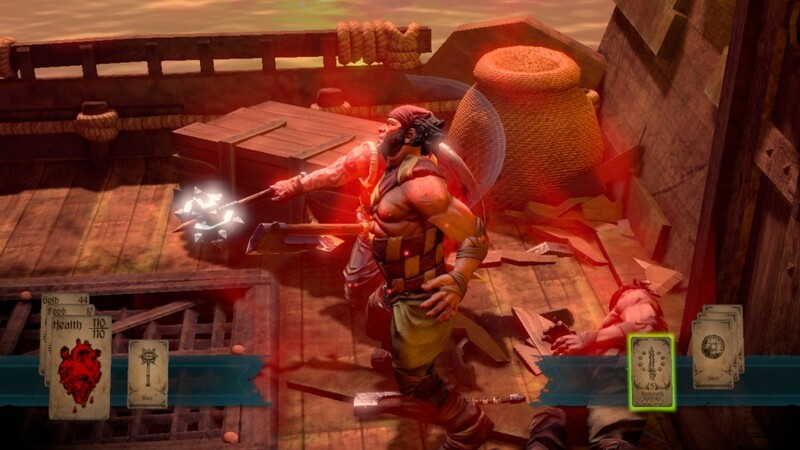 Hand of Fate is a rather swift and bru­tal game, re­quir­ing one to stay aware of the prompts above an en­e­mies head, as well as know­ing when to dodge or press an at­tack. A built‐in com­bo sys­tem re­wards you for keep­ing up the mo­men­tum and and ex­e­cut­ing per­fect com­bos by in­cre­men­tal­ly mak­ing you at­tack faster & hard­er (At least it seemed to be when land­ing com­bos into the high 30s). Numerous pieces of equip­ment are found with­in the card gen­er­at­ed dun­geon and of­ten makes the com­bat go far more quick­ly. This is a good thing to me, as the en­coun­ters be­come more and more dif­fi­cult as the Face cards and reg­u­lar en­coun­ters are beat­en. This hap­pens quite a bit. The sto­ry of Hand of Fate is one that is im­plied through game me­chan­ics and nar­ra­tion, as the play­er re­fus­es to speak (as is so very com­mon in games). However, the Dealer of­ten pro­vides ed­u­cat­ed guess­es about what the life of your ad­ven­tur­er was be­fore he took to play­ing the game. The cards in each deck change with new ad­ven­tur­er. From these cards, one may de­duce what the life of the card play­er was like — as an ex­am­ple. 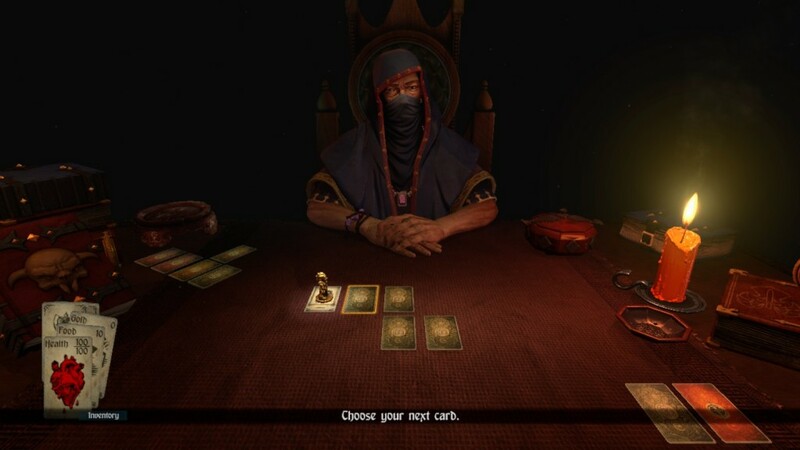 In essence, his past sto­ry ends up tak­ing shape from the present ac­tions you make for him as you play Hand of Fate. But just as Hand of Fate holds back from telling in to­tal the sto­ry of the main char­ac­ter, it of­fers few sto­ries of the Dealer as well. What wisps of sto­ries he will tell of him­self are few and far be­tween, tan­ta­liz­ing de­tails are held back by a man that has seen more than any oth­er Dealer has. While hold­ing back info of him­self, he is very ver­bose and will­ing to talk about the na­ture of his deck, and how it re­lates to the very con­cept of gam­ing it­self. The way the game plays out is you play through a pro­ce­du­ral­ly gen­er­at­ed dun­geon, us­ing the ran­dom­ized en­counter deck to draw cards from that in turn rep­re­sent the main character’s mem­o­ries. In this fash­ion, it be­comes some­thing of a rogue‐like ad­ven­ture. 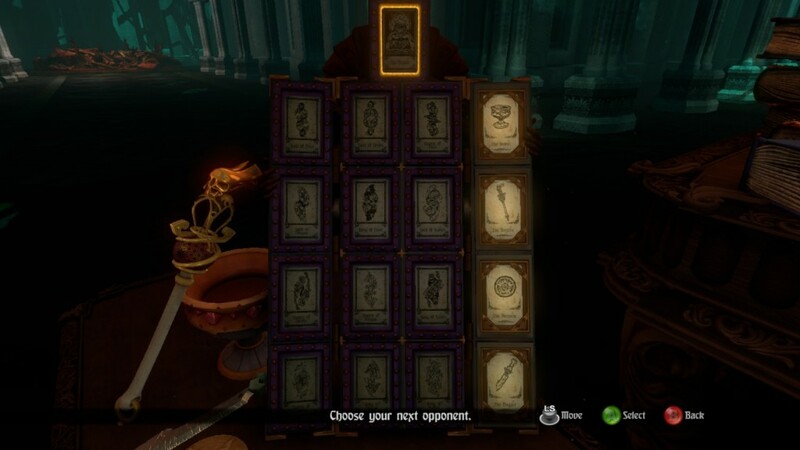 Before set­ting out into each dun­geon you set up both your equip­ment deck and the en­counter deck. When drawn on dur­ing game‐play, each en­counter card has op­tions for the play­er to choose from, (more of­ten than not just a bi­na­ry choice) which cre­ates some­thing of a Choose Your Own Adventure style dun­geon. The sto­ries of each dun­geon change com­plete­ly de­pend­ing on the cards drawn. With each boss you seek to de­feat, the deal­er adds in his own cards, throw­ing in many curs­es, mon­sters, and en­coun­ters in or­der to make your play‐through more dif­fi­cult. However, the game does not pun­ish the play­er for dy­ing. In or­der to get meta re­wards — in the form of to­kens which are ex­changed for more cards — one must ei­ther fin­ish the cur­rent dun­geon or die. There is sec­ond mode in the game as well called end­less mode. This of­fers a more pure rogue‐like, in that the dun­geoneer­ing only ends when your char­ac­ter has died. This is of­ten the eas­i­er route for get­ting more cards and to­kens, as it uses all the cards un­locked as op­posed to need­ing a cho­sen deck the Dealer. The art on dis­play ac­tu­al­ly rather im­pres­sive, with each card fea­tur­ing its own art­work. Considering that there are hun­dreds of cards (this re­view­er es­ti­mates rough­ly two hun­dred) this is by no means a small feat. There is plen­ty of de­tail across the many mon­strous crea­tures you are ex­pect­ed to face. While the game fea­tures nu­mer­ous stan­dard fan­ta­sy mon­sters to face, there is enough vari­a­tion to make the play­er feel im­mersed in the rich at­mos­phere of the game. This is the sort of thing Total Biscuit fuss­es about. 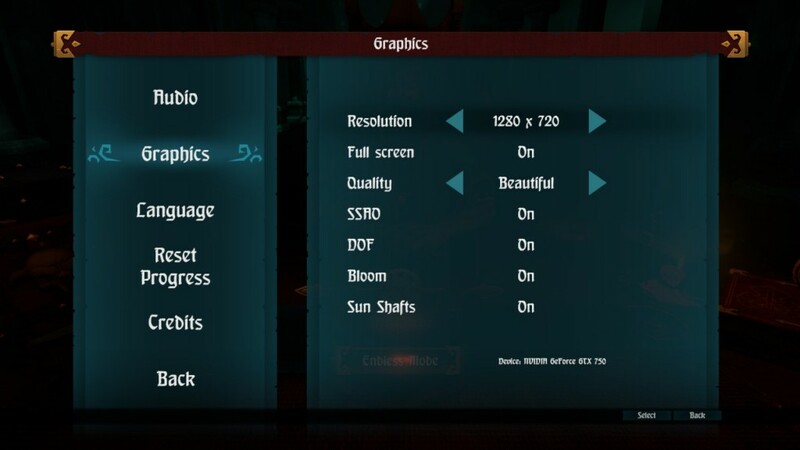 Hand of Fate‘s graph­ics are rather mid­dle of the road. Due to it be­ing port­ed across no less than three sys­tems, the set­tings to tweak are rather sparse. A few ad­vanced op­tions are ac­ces­si­ble in the set­tings and should be enough for all but the most grog­nard of pow­er users. It plays smooth­ly, with no skip­ping on my sys­tem (that in­cludes a Nvidia GTX 750) and the an­i­ma­tions re­main­ing crisp for the most part. There is one gripe in those an­i­ma­tions, how­ev­er, in that they seem a touch… off. They are miss­ing frames, and when com­bat gets es­pe­cial­ly busy, this is­sue be­comes more ap­par­ent. This oth­er­wise trou­bling is­sue is over­shad­owed by the pos­i­tives of the game in my view, though. The sound­track does away with mod­ern in­stru­ments, opt­ing for the me­dieval styled drum, cel­lo and lute. These sim­ple in­stru­ments cre­ate a sur­pris­ing­ly rich and lush at­mos­phere that match­es the rest of Hand of Fate’s tone well. It rarely be­comes repet­i­tive, with the table­top mu­sic re­ly­ing more on the lute. The drums and cel­lo are more rel­e­gat­ed to mark com­bat. As for the the oth­er sound de­sign as­pects, there is very lit­tle in the way of voic­es from the min­ions you fight. The play­er char­ac­ter mere­ly grunts in pain and hit and you will hear shrieks of rage where ap­pro­pri­ate. Monstrous roars of large crea­tures and con­temp­tu­ous, of­ten shrill, cries fill out the dearth of in­ter­ac­tion from many of the char­ac­ters with­in the game. All but one. The dealer’s voice car­ries the sto­ry along and has a rich, ex­pe­ri­enced qual­i­ty to it. It’s dif­fi­cult to de­scribe just how well‐chosen the voice ac­tor was with­out sound­ing pre­ten­tious or even pompous. But his is a won­der­ful choice, full of ex­pe­ri­ence and char­ac­ter. It is a won­der­ful thing to lis­ten to, and I look for­ward to hear­ing more clips of him as I un­lock yet more cards in the game. Indeed, many of the cards have him mak­ing com­ments aloud. With each card, he re­veals more of the back­ground to each of them, re­mind­ing him­self to bal­ance some card lat­er, or re­mark­ing that he made one thing far too pow­er­ful. As a rogue‐like ver­sion of Batman: Arkham Asylum with RPG el­e­ments the game re­al­ly is more than the sum of its parts. Each sec­tion of the game is unique, bear­ing the marks of its in­die roots and yet in­dig­nant­ly ris­ing to the lev­el of gam­ing artistry, lur­ing in the play­er with in­trigu­ing game‐play and in­fi­nite re‐playability. I am glad to have fin­ished it, and am proud to say I have added it to my Steam fa­vorites as well. Buy this Game at Full Price if: You en­joy well done, mod­er­ate­ly dif­fi­cult brawlers and en­joy a good rogue‐like here and there. Buy this Game at a Discount if: You aren’t in­ter­est­ed in mul­ti­ple playthroughs af­ter fin­ish­ing the game to dis­cov­er new card plot‐lines and his­to­ries. Buy this Game at a Steep Discount if: You weren’t at all in­ter­est­ed in Batman: Arkham Asylum, nor can han­dle be­ing set‐back by death. The fol­low­ing two tabs change con­tent be­low. My name is Michael Campbell. 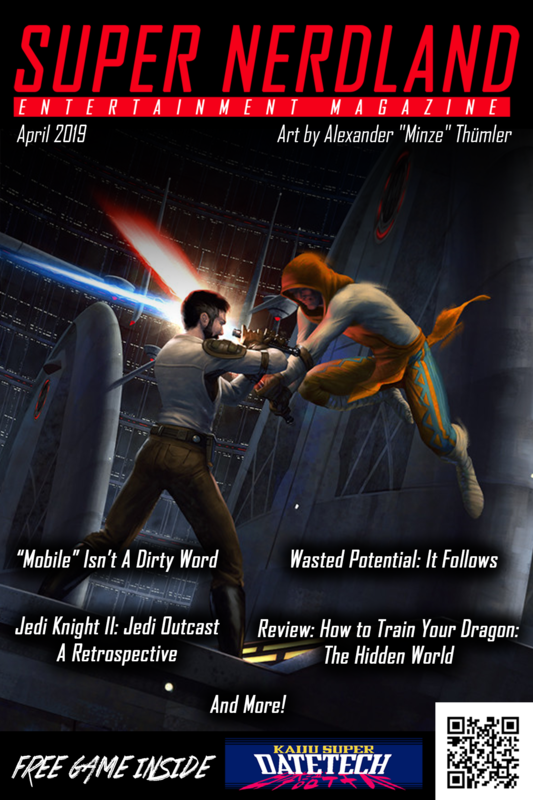 I am a bud­ding writer, pro­duc­er, and the content‐manager for off‐site opin­ion pieces. I fo­cus on Early Access Game Reviews, Traditional Games Media (Primarily Pen & Paper Role‐playing Games), Steam Games, Origin, and Indie Titles. My in­ter­ests in­clude draw­ing re­al­ly ter­ri­bly, run­ning far too many RPG games a week and hor­ri­fy­ing my co‐workers and friends. I also get re­al­ly an­gry on Twitter at in­jus­tice. I am also like­ly go­ing to be­come a fix­ture in the ed­i­to­r­i­al sec­tion of this site, due to the above anger. You can reach me at M.Campbell@supernerdland.com if you have ques­tions or com­ments; As well, you can reach me @EvilBobDALMYT on Twitter to see some of that anger in mo­tion.